As the government and people are paying more and more attention to environmental protection, the garbage sorting machine is becoming more and more popular in the market. The machine makes use of a series of sorting methods and physical reactions to achieve the separation of various garbage. After sorting, each of the final products has their own applications, which can fully realize the goal of recycling garbage to energy. 1. After entering the field, the garbage in the truck will be unloaded on the discharge platform, and then sent to the scale plate feeder by the hopper. 2. After uniformly distributed, the garbage is sent to the manual sorting platform by belt conveyor, where the workers will sort and select the large objects (quilts, cotton clothes, trunk, branches, long sticks, brick and stones, bottles, etc.) and hazardous waste. The bag breaker can break up the garbage wrapped in plastic bags for further sorting. 3. 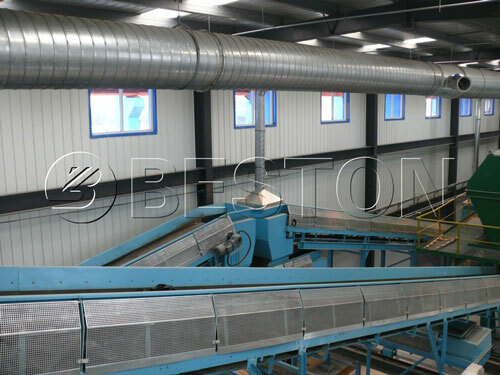 After sorted manually, the garbage will be sent into the screening machine by belt conveyor for screening treatment. Screening is a very important ring for garbage recycling. 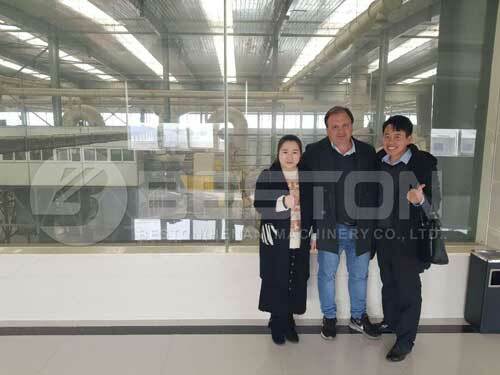 According to the technical requirement, we set the sieve plate diameter of the rotary screening machine as 50mm. 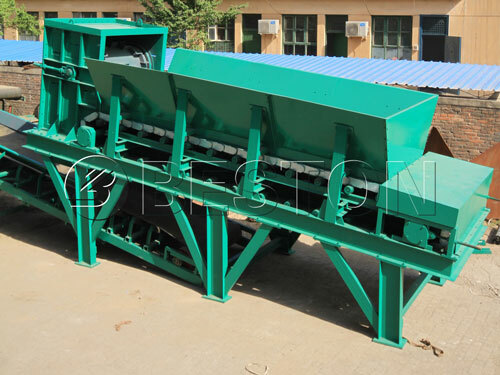 The machine can divide the garbage into two parts: large than 50mm and smaller than 50mm. The garbage smaller than 50mm is mainly organic matter, and the iron objects in this part of organic matter can be selected out by the hanging magnetic separator, and then is directly sent into compost workshop for treatment. 4. The iron materials larger than 50mm (mainly iron beverage cans and iron cans) can be sorted out by magnetic separation. Then the other garbage larger than 50mm is sent into winnowing machine by belt for wind election treatment. 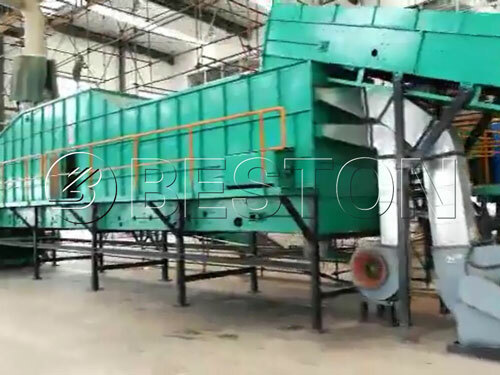 The comprehensive winnowing machine can sort the garbage on the screen out and divide into three parts: the light plastic waste; heavy materials (bricks and tones, rubber shoes, tiles, glass, etc. ); secondary heavy materials (hard plastic, textiles, rubber products, wet paper products, etc.). 5. The three kinds of waste will respectively go to different follow-up devices equipped with garbage sorting machine for further processing. What can we finally get from the garbage sorting machine? These construction materials and broken glasses can be made into new bricks by the related brick production line. The organic matter such as dregs, kitchen garbage, etc. can be added into animal feces and straw to get bio-gas by fermentation system. The bio-gas can be used converted to electricity by gas generator. These items can be made into RDF for gasification generator. These hard paper materials can be processed into new kraft paper. The green waste includes tree leaves, grass, fruit shells and other biomass materials. These waste materials can be used for making charcoal powder by our related charcoal making machine. The charcoal powder can be further processed into briquettes, which can be widely used in many areas, such as BBQ. The PET bottles can be processed into flakes, and then reprocessed into fibers, which can be used for producing clothes, pillow inner, bolster. The other kinds of plastic waste such as PE, PP, ABS, etc. can be processed into fuel oil and carbon black by pyrolysis plant. The fuel oil can be further converted into diesel or gasoline by distillation plant; the carbon black can be processed into fine carbon black such as N220, N330, N660, etc. by carbon black processing plant. Besides, these waste plastic materials also can be packed by automatic hydraulic packing machine and sold directly. 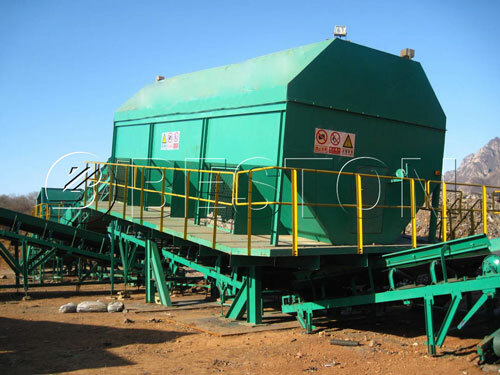 * Plate Feeder: used for feeding raw materials and transport the materials to uniform distributing machine. * Uniform distributing machine: can make the garbage evenly distributed in the belt conveyor, which is easy for the further sorting. * Bag breaking machine: used to crush the garbage bags, so that the garbage in the bags can be broken up and sorted. 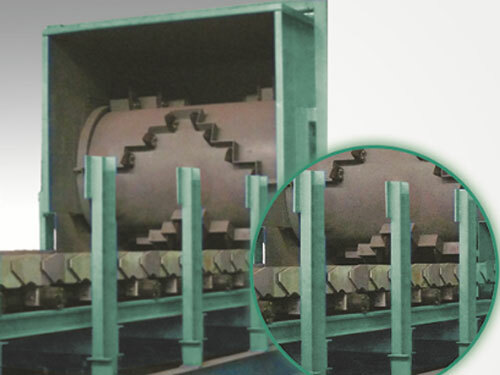 * Rotating screening machine: mainly used for sorting organic matters. 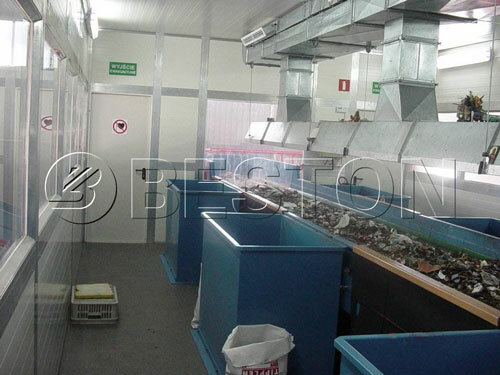 According to the sieve plate size, the garbage can be divided into two parts: larger than 50mm and smaller than 50mm. After going through the magnetic separation system, the iron materials in the organic materials (smaller than 50mm) can be selected out. Then the organic matters can be used for composting. * Comprehensive suction system: through suction machine of the garbage sorting machine, the materials larger than 50mm can be divided into three parts: light plastic waste; heavy substances (brick and stone, rubber shoes, porcelain, glass, etc. ); secondary heavy substances (hard plastic, textiles, rubber products, wet paper products, etc.). 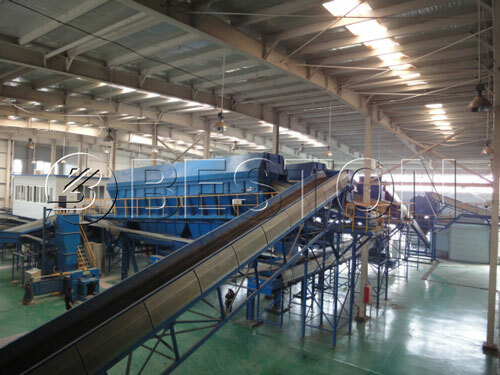 * Sealed belt conveyor: mainly used for transporting garbage. 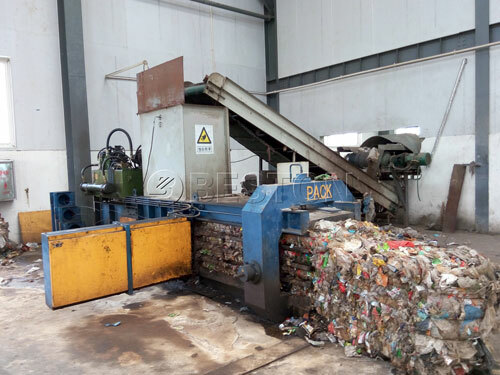 It is very necessary for the solid waste recycling process because it can reduce the dust and ashes in the working place effectively to make sure a sanitary and healthy working environment. * Suspension type magnetic separator: mainly used to sort out iron materials, such as the battery, coins, iron cans, etc. 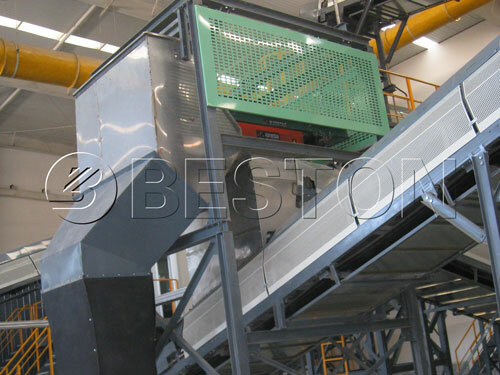 * Manual sorting platform: firstly, after distributed, the garbage is sent to manual sorting platform. The large pieces of garbage will be sorted out manually, such as clothes, wood furniture, etc. The comprehensive suction system will separate heavy substances, sub-heavy substances, and lightweight plastic out from the garbage. These three kinds of substances need to be sent to the manual sorting platform for picking out useful substances before recycling. * Automatic hydraulic packing machine: used to pack light plastic waste, to reduce the occupied space by light materials, which will be convenient for the storage and transportation of light materials. A: Chat with us privately or leave your message. Q: What kind of inorganic materials can be sorted out? What can I do in addition to be used as building materials? A: Dust, stone, glass, ceramic, etc. All of these materials are used for making building materials currently. Q: How to deal with the waste odor and noise decibel in the production process? A: The exhaust gas goes through the dust removal system, and the odor is treated by spray deodorant. The noise decibels are normal. Q: Can waste paper and thin plastic be separated? Q: Can sorted plastic waste be converted by crude oil? A: Yes. Theoretically, the rubber also can be. Q: Does the municipal solid waste sorting plant need to be equipped with a dryer? 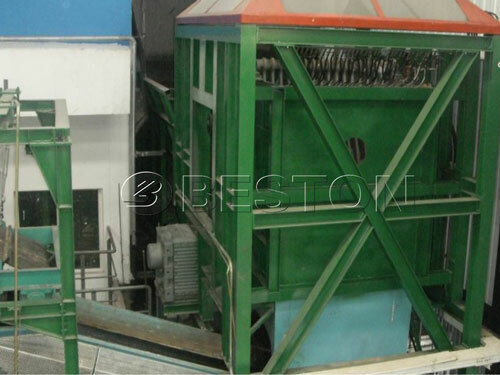 Beston garbage sorting machine can be used for disposing of municipal solid waste (MSW), household waste, construction waste, plastic sorting, etc. The machine has been exported to Uzbekistan this year, and has obtained large support from the local government. In the near future, the garbage separation machine can not only improve the local environment but also drive the local economy.